Description: An audio panning circuit that redirects the audio from the left channel of a stereo audio jack to the left, right, or both ears of the output socket. This a part of a larger project using analog audio signal processing to introduce e-textiles. The full project down-mixes a stereo audio signal to mono and then pans that signal, left, right, or center. This swatch doesn’t include the mixer and instead only pans a single audio channel. To interact with the swatch, plug the jack into an audio source like a phone or music player and a pair of headphones into the socket. Take care to firmly hold onto the jack and socket when plugging and unplugging so that they aren’t torn off the wires. 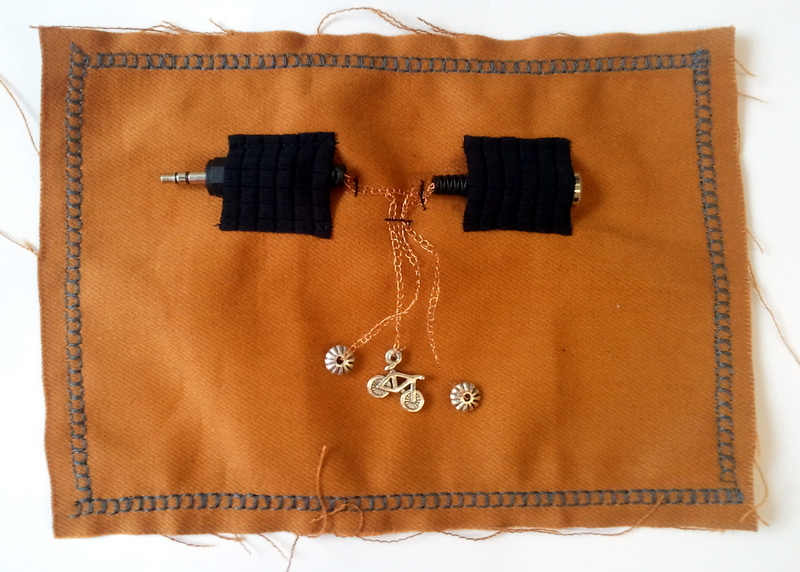 Hold the bicycle bead against one of the other beads to hear the audio played through only one ear and hold it against the other bead to hear it through the other. Hold all three beads together to hear the audio through both ears at the same time. References/Inspirations (where applicable): The swatch is a small section of the Solo Disco Scarf, a workshop originally developed by Codasign for Wear-It Berlin 2014.